On this date in 1930 German voters went to the polls to elect a new Reichs­tag, and the results were shocking. The National Socialist Ger­man Workers’ Party (National­sozialistische Deutsche Arbeiter­partei, or NSDAP) was the ninth and smallest of Germany’s poli­tical parties, with but twelve mem­bers in the national parlia­ment. In the elec­tions of 1928 the NSDAP had captured a paltry 2.6 per­cent of the vote—810,000 votes out of 31 million cast. But the party’s out­spoken, uncon­ven­tional, dyna­mic leader, or Fuehrer, Adolf Hitler hoped to quad­ruple that num­ber by cap­turing the imagi­na­tion of a wide cross-section of voters, not just those who made up his ex­treme nation­al­ist base. By the end of the day Septem­ber 14, 1930, the elec­tion results exceeded Hitler’s wildest dreams: the Nazis, as party mem­bers were known, had won 107 seats in the Reichs­tag, which vaulted them into the second largest party in Ger­many. In the two gen­er­al elec­tions in 1932, Hitler’s party—helped by the mili­tant tac­tics of his thug­gish brown-shirted sup­porters, the SA (short for the German Sturm­ab­teilung)—won 37 per­cent and 34 per­cent of the vote, which made the Nazi Party the largest party in the Reichs­tag. Hitler didn’t have a majority of seats, but he had enough that poli­ti­cians and the elec­tor­ate had to take him seriously. In the tem­pest of parlia­men­tary politics in late Janu­ary 1933 Presi­dent Paul von Hinden­burg named Hitler Chan­cellor of Ger­many and head of yet another coali­tion govern­ment in the Wei­mar Republic, an en­tity spawned in the after­math of the widely de­spised 1919 Versail­les settle­ment. Within months of being named chan­cellor Hitler headed a totali­tar­ian govern­ment. With the death of 87-year-old Presi­dent Hinden­burg on August 2, 1934, Hitler lickety-split ordered a pleb­i­scite for August 19, seeking ap­proval to com­bine the offices of presi­dent and chan­cellor. Ger­many’s voters went to the polls and a whop­ping 90 per­cent voted Ja. The next day the cabi­net decreed the “Law on the Alle­giance of Civil Ser­vants and Sol­diers of the Armed Forces.” Known as the Hitler Oath, the law required armed forces and civil service per­son­nel to swear obe­dience to the “Bava­rian cor­poral,” as Hinden­burg once referred to Hitler, instead of obe­dience to the German consti­tu­tion or nation. From that day on Hitler ruled his nation by decree. 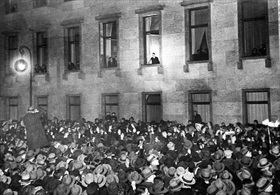 Left: Newly appointed Chancellor Hitler at the win­dow of the Reich Chan­cel­lery on Berlin’s Wilhelm­strasse receiving ova­tions on the evening of Janu­ary 30, 1933. Presi­dent Hinden­burg (elected second presi­dent of the Wei­mar Repub­lic in 1925) was no admirer of Hitler and ini­tially refused to name him chan­cellor. Instead, he appointed fellow army officer Maj. Gen. Kurt von Schleicher to the posi­tion. 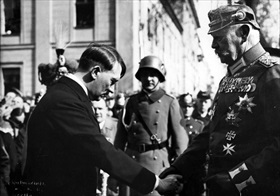 Politi­cal in­trigue, cabi­net crises, and back­room nego­ti­a­tions prompted an exas­perated Hinden­burg to end govern­ment insta­bility by appointing Hitler to head a new cabi­net and naming ex-Chan­cellor Franz von Papen as vice-chan­cellor, with the under­standing that Papen would act as a “check” on Hitler’s more dis­turbing ten­den­cies and en­courage him to tamp down on the law­less­ness and ruth­less­ness of the SA, his party’s paramilitary thugs. 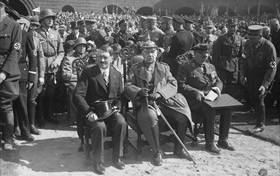 Right: Hindenburg and Hitler on March 21, 1933, known as the “Day of Pots­dam.” On that day the newly elected Reichs­tag was con­sti­tuted with an opening cere­mony in Pots­dam’s Baroque Gar­ri­son Church. (A new venue was made neces­sary by the Reichs­tag fire on Febru­ary 27, 1933.) The Pots­dam gala was a Nazi propa­ganda pitch to demon­strate unity between the Hitler’s populist move­ment and the old aristo­cratic, con­ser­va­tive, and Prus­sian military elite represented by Hindenburg. 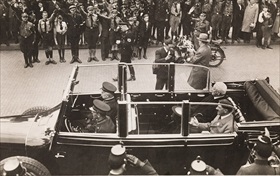 Left: Hindenburg and Hitler ride in an open-top car at the May Day rally, where Hinden­burg had delivered a speech in Berlin’s Lust­garten, May 1, 1933. The day had been declared the “Day of National Labor.” Twenty-four hours later Hitler banned and dis­banded German trade unions. Right: Hitler, Hindenburg, and Her­mann Goering at a massive demon­stra­tion at the Tannen­berg Memo­rial near Tannen­berg, East Prus­sia (today Olsztyn, Poland) in August 1933. The castle-like memo­rial of eight towers around a cen­tral court­yard com­memo­rated the anni­ver­sary of the Second Battle of Tannen­berg (August 23–30, 1914), a vic­tory over the Russians that made Field Marshal Hinden­burg a national hero. Against his wishes Hinden­burg was buried in the cen­tral yard of the Tannen­berg Memo­rial during a large state funeral—this on August 7, 1934, five days after his death.